I am relieved and thrilled to report that Pearl seems to be on the mend. She is not out of the woods yet after being the victim of a dog attack, but is a whole lot better. Two days ago, Pearl bolted out of her stall when my husband and I opened the door to initiate the morning care routine. She was full of energy and running on three legs. She’s still not putting the leg that sustained three dog bite puncture wounds, on the ground. There is still some swelling present, meaning there is likely still infection in the wounds – which are slightly hot to the touch still. Pearly goat, knowing our usual morning barnyard routine, ran past the ducks and into the feed and tack room. I converted an extra wide stall in a combo feed and tack room. Everyone said I would regret doing so because all of the critters could wander in and out since it’s an open stall – and the chickens would do their business on my hanging saddles and tack. They were wrong, just like I told them they would be. My critters have manners…even the roosters. When I reached the tack and feed room, there was Pearl in her favorite spot, on top of the feed fridge. We laid an old side-by-side refrigerator from a rental property on its back and use the fridge part for horse, mini donkey, and pony feed and the other side for poultry feed. Pearl was pacing back and forth encouraging me to hurry up and start scooping – while prancing across both fridge doors and delaying the process. It was beyond wonderful to see her back to herself. Sure, she looks a might odd with only one ear, but it doesn’t seem to bother her at all, she knows she is still a beautiful creature – solo ear or not. The ear wound healed both well and quickly, it’s the leg wound that’s still causing us concern. I am hopeful both the Penicillin injections and the natural remedies are going to continue to help deal with the infection and eventually she will be able to use her injured leg again. I truly feel my natural remedies have played a significant role in her recovery. It was not until I focused heavily on them that we witnessed true improvement. My still natural remedy skeptic of a beloved husband has been forced to admit I may be right…as usual. I spent several hours researching dosage for goats in general and Nigerian Dwarf goats in particular, do to the size difference. Even though goats of any breed are far smaller than cows, the dosage is nearly the same. Because goats are also ruminants, they have four stomach chambers, just like a cow. Many folks mistakenly think cows have four stomachs, they do not. A ruminant animal has a quick metabolism, so giving one medication orally might be a futile effort. The medicine is typically expelled through waste far too quickly and cannot properly absorb into the bloodstream. The Penicillin was probably doing its job, but for the first four days I saw no visual proof that the injections were working. The infection in Pearl’s leg was hot, hard, and decidedly swollen. It appeared to be spreading to beyond her leg into the shoulder and chest area. She loves bread, it is her favorite treat. I know bread is not good for goats, it can definitely lead to bloat problems, but she was hurt and deserved a special treat – particularly one that nibbling on kept her calm while we administered the injections. It was difficult to hold her still not only because she is a strong little thing even when hurt, but because of her injuries there really wasn’t much space on her tiny body to grasp onto firmly without causing additional pain. I started sprinkling her bread bits with turmeric, oregano, honey, and molasses. The molasses really doesn’t possess any healing properties, but it is a great nutrient booster. Yep, it was quite a treat and the rest of the barnyard was rather perturbed they were not being hand fed the same thing. The horses would crowd around the two half-walls of the nursing stall where we put her during the recovery – stretching their necks as far as they could to try and get a bite. The flock kept flying into the stall, and at least once, Soup (a banty hen) stole a piece of bread right out of Pearls’ mouth. I also put dandelion root and dandelion flakes in Pearl’s water bowl to help her heal and ward off infection. Diatomaceous earth was sprinkled on her feed, as well. It is not necessarily known as a natural infection fighter, but it is a superb natural detoxifier, so I felt it might help as well. Next, I made an infection drawing poultice that my Bobby and I put on her injured leg every night. I mixed together bread and milk and then sprinkled in very thinly diced onions or potatoes – sometimes both. The bread and milk alone could have been used as a infection drawing agent, but the addition of the other two infection and toxin drawing food items gave it an extra boost. I have seen the bread and milk drawing poultice used specifically on dog bite puncture wounds successfully several times. When we took the poultice off in the morning, it stunk to high heaven – and that was good thing. The rank smell indicated that infection was indeed being pulled out of Pearly goat’s wounds. The fur on her leg also smelled awful and was hard and crusting, indicating the infection was coming out of the wounds and trickling down her legs. The local livestock vet sold us a tetanus shot to give Pearl, so she was treated with that as well. I had no idea whether or not she had been given a tetanus shot before we rescued her from life in a small pen, but the vet said even if she had, it would not harm her to get another one to help combat the dog bite. We have had Pearl for about seven months, so a decent amount of time would have passed even if she had been given a tetanus shot right before she came to live with us. Here, she and her mate, Not Negan, and her first kid that was born in December – Rooster, free range. Pearl was in the process of weaning Rooster when she was attacked. I was looking forward to milking her for the first time and making soap, cheese, and getting milk to drink. But, because of the timing of the attack, her still having milk became extremely problematic. I couldn’t let Rooster suckle because of the infection and antibiotics Pearl was being given, yet I could not allow the milk to swell up in her udders as well. As gently as possible, I would milk my injured goat. She did not like it, and it definitely did not help that she had never been milked before. But, together, we got through it. Pearl does not seem to mind going back to the nursing stall at night to sleep, She follows me to the stall and walks inside so I can shut the door. I hate confining her, but she is not in a position to protect herself or evade nigh time predators right now. 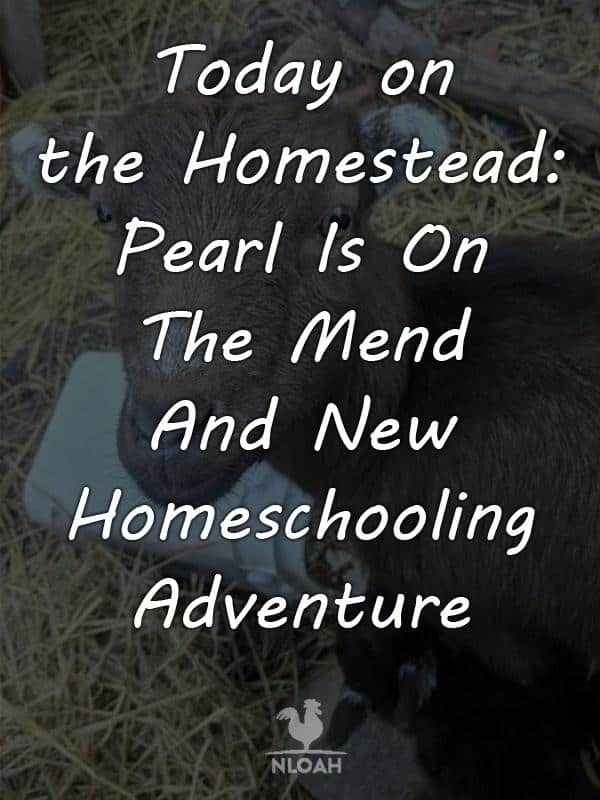 When I was not caring for Pearl and doing my normal writing and barnyard work, I was spending time working on a new passion project – a homeschooling curriculum designed especially for homesteading and self-reliant preparedness families. I have written homeschooling articles for quite a long time. Using my background as an educator I have created homeschooling lesson plans that are geared towards self-reliance and meaningful learning. I felt it was time to do something more comprehensive. 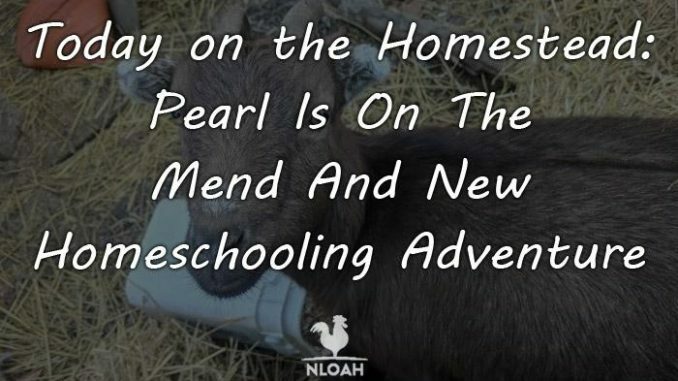 Homeschooling and preparedness families are a large portion of the millions of homeschooling families in the United States and deserve an affordable curriculum created to address their specific goals and lifestyle. Learning does not and should not be required to take place in a seated position at a table. Completing printed worksheets. When I pulled my daughter out of public school during the middle of her junior year, she began attending an online charter school. The curriculum there mirrored the same type of old-fashioned education I received more closely than any other program I could find at the time. But now, she is a wife and mother herself and her three children will be homeschooled on our homestead. That fact motivated me to start working now on a meaningful and hands-on curriculum. Her oldest child won’t be old enough to start kindergarten for two more years, so I had plenty of time to create and then fine-tune the perfect homeschooling homestead curriculum. Once I decided to start working on a homeschooling curriculum for our three youngest grandchildren, I became so inspired and excited by the project, two things happened: I got a lot further than I thought in a short amount of time and I felt it would be selfish to keep the curriculum all to myself! I am a month away from launching the preview of the curriculum on a website that is still a work in progress, but you can check it out here, if you like. What happened on your homestead this week? Thank you so much for your kind words. 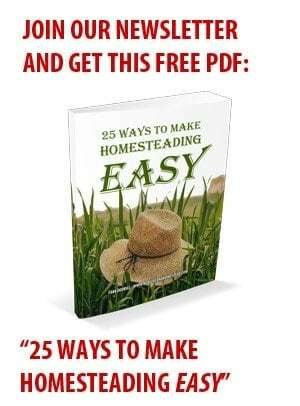 We definitely approach this homesteading thing the same way – with lots of love and joy. What an exciting find in your barn! You won’t have to do any weed eating around your place with all of those hungry little cuties wandering around!I love my evil Rooster too! Prayers go out for Pearl, may her wounds heal and her high spirits keep you going! I too have Nigerian Dwarfs with 5 babies born during the month of Jan & Feb (dear ole Boots & Elvis got out of their pens)not a good time to be having little ones, but they were kept warm in their stalls & mamas warm milk. Then last evening I was out locking up animals for the night & there in a snug corner were two itsy bitsy baby goats! Cinnamon gave birth during the day sometime & mom & babies are doing well. Since they were born on my cousin Charlies birthday, it is only appropriate that I name them Carlos & Carlota. The joy I feel every morning when I see my sheep, goats & the babies, chickens & a turkey hen, I thank the Lord for every one of them; even Zacatecas the mean Bantum rooster. Wouldn’t trade my chores for any thing! Thank you Tara, for your website & articles- makes me feel good that I’m not the only farm nut! Have a great Day & God bless!